The terms "online" and "offline" (also stylized as "on-line" and "off-line") have specific meanings in regard to computer technology and telecommunications. In general, "online" indicates a state of connectivity, while "offline" indicates a disconnected state. In common usage, "online" often refers to the Internet or the World-Wide Web. The concepts have however been extended from their computing and telecommunication meanings into the area of human interaction and conversation, such that even offline can be used in contrast to the common usage of online. For example, discussions taking place during a business meeting are "online", while issues that do not concern all participants of the meeting should be "taken offline" — continued outside of the meeting. A third example of a common use of these concepts is a web browser that can be instructed to be in either online or offline states. The browser attempts to fetch pages from servers while only in the online state. In the offline state, users can perform offline browsing, where pages can be browsed using local copies of those pages that have previously been downloaded while in the on-line state. This can be useful when the computer is offline and connection to the Internet is impossible or undesirable. The pages are downloaded either implicitly into the web browser's own cache as a result of prior online browsing by the user or explicitly by a browser configured to keep local copies of certain web pages, which are updated when the browser is in the online state, either by checking that the local copies are up-to-date at regular intervals or by checking that the local copies are up-to-date whenever the browser is switched to the on-line state. One such web browser capable of being explicitly configured to download pages for offline browsing is Internet Explorer. When pages are added to the Favourites list, they can be marked to be "available for offline browsing". Internet Explorer will download to local copies both the marked page and, optionally, all of the pages that it links to. In Internet Explorer version 6, the level of direct and indirect links, the maximum amount of local disc space allowed to be consumed, and the schedule on which local copies are checked to see whether they are up-to-date, are configurable for each individual Favourites entry. Offline browsing known as "Offline favourites" was removed as a feature in Internet Explorer 7, which now supports only saving single web pages, but not an entire site. Likewise, offline storage is computer data storage that is not "available for immediate use on demand by the system without human intervention." The distinction between online and offline is conventionally seen as the distinction between computer-mediated communication and face-to-face communication (e.g., face time), respectively. 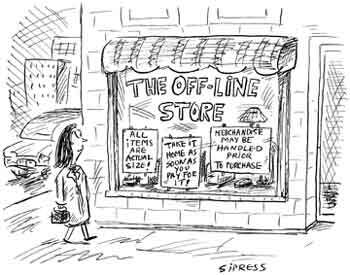 Online is virtuality or cyberspace, and offline is reality (i.e., Real life or meatspace). Slater states that this distinction is "obviously far too simple". To support his argument that the distinctions in relationships are more complex than a simple online/offline dichotomy, he observes that some people draw no distinction between an on-line relationship, such as indulging in cybersex, and an offline relationship, such as being pen pals. He also argues that even the telephone can be regarded as an online experience in some circumstances, and that the blurring of the distinctions between the uses of various technologies (such as PDA and mobile phone, internet television and Internet, and telephone and Voice over Internet Protocol) has made it "impossible to use the term on-line meaningfully in the sense that was employed by the first generation of Internet research". This page was last modified on 7 December 2011 at 04:36.